"Cupboards have the unique function of both being ornamental and exciting in their design while creating a complementary display for fine pewter, china and other valued smalls. 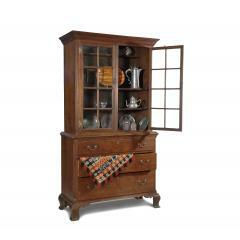 If there is a cupboard you are looking for and do not see, please call or email, we may not have cataloged it yet." Straight sides with lollypop top, four shelves and panelled doors below with nice base molding and a wonderful patina overall. An elegant expression of clean lines and beautiful walnut. 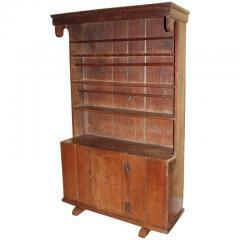 This cupboard has a raised panel door and a scalloped tail below with 2 shelves. The width from the corner to the edge of the cupboard is 17.5". Has double glass doors above two paneled doors below with scalloped shelves. Brass H-hinges and original ogee feet. This cupboard does have a removable installed interior light. 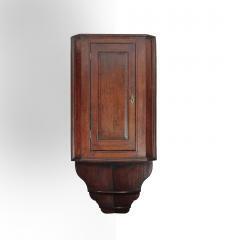 Has a scalloped top with a centered urn and finial over double-arched glass doors with four panes in each door. 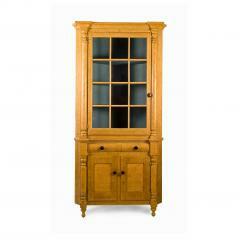 A nice mid-molding separates the top from raised panel double doors in the base. The base rests over a molding and ogee feet. Cupboard painted light mustard yellow has a glass door, two drawers, two doors below and turned ball feet. Interior painted blue. Original glass and interior paint. 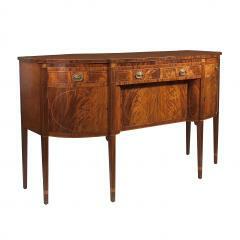 A beautiful sideboard with highly grained mahogany veneer over a pine frame and tulip poplar drawer sides. 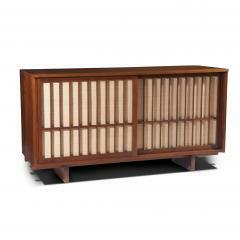 Line inlay provides accented decoration for each architectural component of the piece. It has poplar and white pine secondary woods. One of two known, this pewter press joins desirable architectural elements in perfect symmetry. 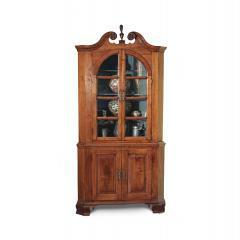 A bold cornice sits above the top case with glass doors and fluted quarter columns. A nice base molding joins the base to the top with a three-drawer arrangement over bold ogee feet. Interestingly, the backboards and shelves are made of walnut. 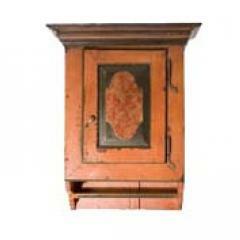 Cupboard with bold cornice, raised panel door, rattail hinges and scalloped base.